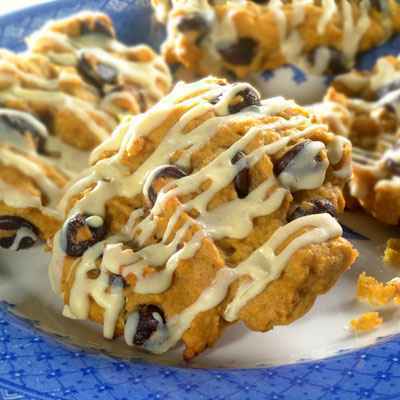 Lets have a cocktail...: Take A Bite Of: The best pumpkin chocolate chip cookie. Ever. Take A Bite Of: The best pumpkin chocolate chip cookie. Ever. Happy October. Let me be the first to say, I love fall. And bring on the pumpkin. Since you have clearly already seen the pumpkins out, why not start on your fall baking? This is one of my favorite recipes for this time of year. Or for all year. Or what I like to call yum, yum, give me some. So I must share it again. And not sure about pumpkin and chocolate chip together? Don't be afraid. These are fantastic. And perfect for sharing (or eating them yourself.) From my kitchen to yours, enjoy every bite. Combine flour, pumpkin pie spice, baking powder, baking soda and salt in medium bowl. Beat butter and sugar in large mixer bowl until creamy. Beat in pumpkin, eggs and vanilla extract. Gradually beat in flour mixture. Stir in morsels. Drop by rounded tablespoon onto prepared baking sheets. FOR VANILLA GLAZE:Combine 1 cup powdered sugar, 1 to 1 1/2 tablespoons milk and 1/2 teaspoon vanilla extract in small bowl; mix well. JennyMac I think I love you.. they look and sound amazing. These sound fabulous. I'm making them tomorrow - and all month long!! I love pumpkin and chocolate together! Thanks for sharing! They look and sound fabulous! Hi Jenny - talk about yummm...will be baking. Thank you. I love fall too & why when I think of fall do I always think of Snohomish? Must be from all of the pumpkin patches?! Hope you three are all super & wishing you a fun fall weekend. At last we are loving the zero humidity, it's like California weather. Too good to be true. Cheers ~ Deb your fellow Snoho! So I've got my girls coming tonight and I was thinking I might whip up some choc chip cookies but this sounds far more special! I'm still battling a basement that wants to continue to flood after this weeks mini hurricane but I'll give you a full report if I actually get to make these cookies happen! I can't believe you ruined a perfectly good chocolate chip cookie by putting pumpkin in it. Pumpkin and chocolate is a well-loved combo over here. Thanks for the recipe! These sound awesome. Thank you for sharing them with us. My thighs and I love you. I love pumpkin chocolate chip cookies! Absolutely love them! Never had them iced before! I am so trying these! Might have to go out on a limb here and try them...not a huge fan of pumpkin, so I hope the pumpkin is not too over-powering. I have been looking for this exact thing! YUM-- and thank you! You are like Rachel Ray to me...I love trying your recipes and my friends love you for it too!! MMM. pumpkin and chocolate...AND icing..what more can a gal ask for?? Yum! Two of my favorite flavors. Two of my very favorite flavors in one delicious cookie. YUM! This looks evil but yummy. If only my baking license had no been suspended. Wish I'd had this recipe last week! Had my Halloween party last night. Yes, it was a little early - but it was the only night that worked! I just happen to have these ingredients in my cupboard. But do you know the nutrition info? Or do I even want to know? I love fall too, except if I lived in a cold place I would be very sad because that would mean winter was just around the corner. That would make me sad. Those sound so yummy, BUT unless they are fat free & sugar free I will never get to taste them. There was a period of time when I never wanted to smell another pumpkin, nor feel it's bloody pulp between my fingers. That was when my BFF's mom decided to teach us how to cook.... pumpkins; toasted, baked, fried, cookies, bread, butter, wah. But, that was fifteen years ago and I think I'm ready, Jenny Mac. Thanks for helping me face my past and move on. Yum!!!!! We're going to an anniversary dinner on sun for my aunt and uncle, she LOVES anything pumpkin flavored, so this is perfect. I'm going to make this and take them. Thanks! JennyM you know the reason I never read your Saturday recipe posts is I would go into hyperglycemia shock just looking at the pictures. I'd have to be totally stupid not to make these, so see you later-- I'm making a shopping list. Tomorrow will be a great day to bake! YUM! I cannot wait to make these tonight! I finally got around to making these - to rave reviews! They were wonderful. I'll bet they'd be good with butterscotch chips, as well. I made these for a cooke exchange, mine didn't look near as pretty as the picture, they tasted OK (next time I may add some coconut). I knew I'd have to make cookies for a class party so I kept marking this as unread and eventually saved it to my phone. I am So glad I did! They were Great! I knew my kids would probably like them, but I wasn't too sure about their classmates or about myself. I'm not usually a fan of pumpkin/pumpkin spice things. But these smelled so good I had to try one. This is now going to be a recipe I pull out every year and use for fall parties instead of regular chocolate chip cookies. Thanks for sharing!